Hey, Pecking Order! It's been a while. So let's ease in with a ranking that's very dear to my heart. Creative Assembly's Total War series has been massacring infantry for over a decade now, and in that time has gone from Shogunate Japan to Medieval Europe to ancient Rome the age of sail then...right back around again. My Steam statistics reveal an embarrassing amount of time spent playing these games. We're talking thousands of hours. I like to think that, over those hours, I've developed a taste for what I like, and what I don't like, about the series. Before we go any further, though, two things to note! The first is that this is my list. Just mine, not Kotaku's. You may disagree, and are welcome to make your arguments in the comments below! The second is that, like other Pecking Order lists, we're only dealing with main games here. Any spinoffs or major expansions (like Fall of the Samurai) will be lumped in with the game they were released for. I know. I'm crazy, right? 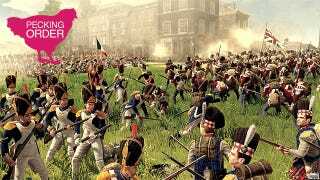 Empire is many people's least favourite Total War game, but even with its AI issues and bugs I still love this game to death. Partly because it's my favourite time period of any Total War game (omg history bias), but mostly because of its scale. I can forgive the bugs if it means I can manage campaigns that span from the Great Plains to Sri Lanka (and, unlike in Rome 2, actually have them remain manageable). In some ways the peak of the series, because everything just clicked. The politics, the unit variety, it all just came together. You might call it a fluke, since CA's return to Rome was nowhere near as memorable, but I like to think it's just that lightning doesn't strike twice. I get the argument that it's dumbed down. That campaign map is as linear as a modern FPS, for example. But in other ways Shogun 2 is an exercise in how CA can do wonderful things when they keep a short leash on their ambition. Shogun 2 has the sharpest focus of any game in the series, and the best historical immersion. The last of the "old school" Total War games (before Empire's complete overhaul), its campaign management is showing its age, but its battles are still surprisingly attractive. One thing I've noticed as time has gone on: it's a very "grim" game. Which might be authentic, but it's also a real downer. It might seem simple at glance, but there's still some fun to be had in those old battles. They're so fast, and simple. It's almost like an arcade version of Shogun 2. Just go play Medieval 2 already. Oh dear. A series of patches and a pretty good expansion have salvaged what was shaping up to be a disaster, but only just. From unwieldy management to an overblown campaign map to some farcical siege AI, Rome 2 is the anti-Shogun 2, lacking in any sense of focus or ability to keep its campaigns fresh and interesting. This was not a Total War game. It was a glorified expansion pack. Some neat ideas (it introduced "liberation" of conquered territories, and had a great expansion) and sharpened AI couldn't disguise the fact that this was too close to Empire: Total War for comfort.